What's Halloween without the candy? 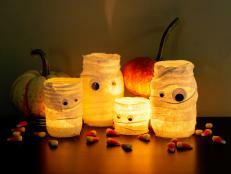 Keep these crafty bowls filled and the little monsters will come running! 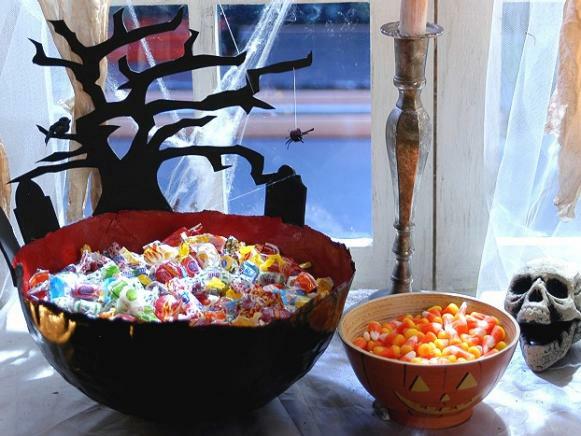 Convert plain bowls into Halloween art, perfect for showcasing all that yummy candy! 1. Turn the bowl that will serve as the mold upside down and cover the outside with aluminum foil. Fold excess foil into the interior of the bowl. 2. Tear the bags or craft paper into roughly 2" to 3" pieces. 3. Mix four parts decoupage medium with one part water in a mixing bowl. Dip each paper piece in the solution and place on the outside of the foil-covered bowl, overlapping the paper to cover the bowl. Work with the bowl inverted over a can so that it is easy to spin. Continue adding paper until 3-4 layers of paper cover the outside of the bowl. 4. Allow the bowl to dry for 24 hours. 5. When the paper bowl is dry, gently peel the foil off the inside of the glass bowl, releasing the bowl from the paper shell. Gently peel foil from the paper shell. 6. Paint the paper bowl. 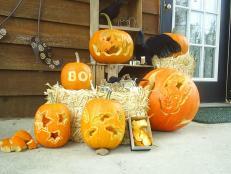 We used black spray paint on the outside and red house paint on the inside. Allow the paint to dry. 7. 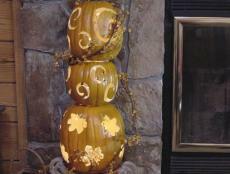 With a craft knife, cut a spooky tree and three tombstone shapes from black craft foam. If using templates, transfer the images onto the craft foam with light colored transfer paper, holding the paper in position with blue painter's tape. Glue these shapes to the outside of the bowl with foam glue. Use clothespins to hold the foam pieces in place while the glue dries for 24 hours. 8. 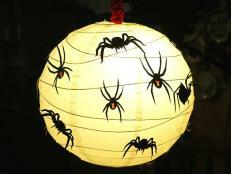 Create a spider by threading black embroidery floss through a small black pompom. Secure the embroidery floss "legs" by coating them with glue. String the spider on a piece of white thread and attach to the tree. 9. Paint a small bird figurine black with craft paint and glue it to the tree. If the tree begins to droop, brace it with a bamboo skewer that has been painted black and glued both to the back of the tree and the top of the bowl. Do you love macramé, but are knot challenged? 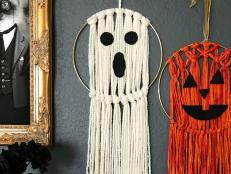 Try this easy Halloween wall hanging that is as easy to make as it is adorable. 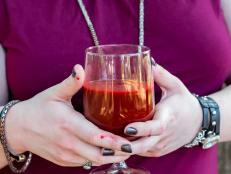 Give your friends a fright this Halloween with this easy (and surprisingly delicious) faux blood recipe. 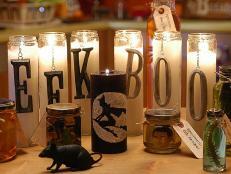 Turn old jars into fun Halloween decor. 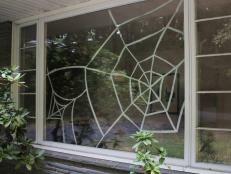 We’d hate to see the spider that lives in this DIY Halloween window display.